Thanks to Andrea and Pam for a lovely weekend (first weekend in Nov)! We had a beading lesson, mini display of our stitched projects, 3 vendors, and Sunday brunch. Pam’s beading lesson on Saturday night sure was timely because I used one of the 3 methods for attaching the bugle beads which made it a lot easier. And, Pam gave us a blank canvas, directions, and 2 skeins of DMC floss that could be stitched into a crazy quilt base for applying some lovely ribbon work. She’s offering a 2-day ribbon class at The Edwardian Needle in January. I sure hope the weather cooperates because Linda and I’ve been wanting a ribbon class. This will be perfect. There were door prizes and Linda, Buff, and I won canvases!! Isn’t this cute. I was almost able to finish the Bronze Purse on Sunday but was too tired to apply the final medallion and fill in another area when I got home. Monday was running errands. So, I finished it last Tuesday. I usually wait until after my ANG meetings to post a new finish but I’m getting behind on my blog postings! The Main Line Chapter meets tonight & we are loving our new Starbucks location in Wayne, PA. Thanks to my ANG Main Line Chapter member Patrick who is also President of the Embroidery Guild of America (EGA) Brandywine Chapter, our members have been invited to attend a talk by Doug Kreinik if we join EGA or Delaware Valley Historical Sampler Guild (DVHSG). Today, I joined 8 EGA members at a Stitch ‘n Chat at Shirley H’s house. Among all her beautiful needlepoint, I recognized her piece, Roses, from seeing it a few years ago at the Rehoboth Needlepoint Exhibit. It won Best in Show! All the ladies were nice and welcoming. They were all working on different projects which is fun to see. And, I got quite a bit done in the 4-hour session excluding our lunch break. This is the Toni Gerdes Bronze Purse that I started at Blue Bonnet in February. 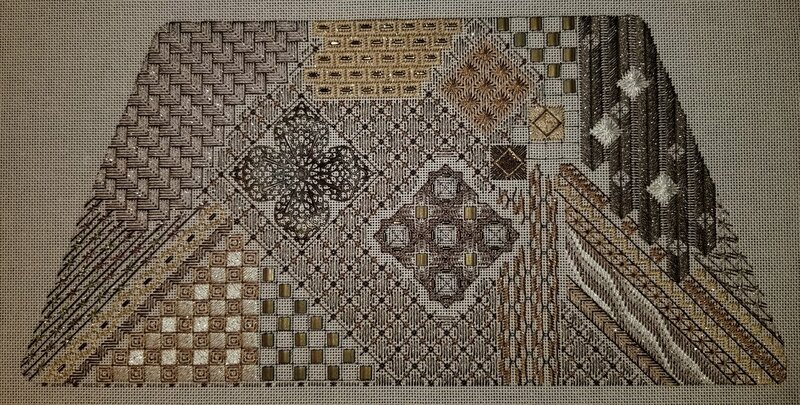 Today, I finished the bottom left corner including the dark brown laid stitches with the sparkly diagonal cross stitches. 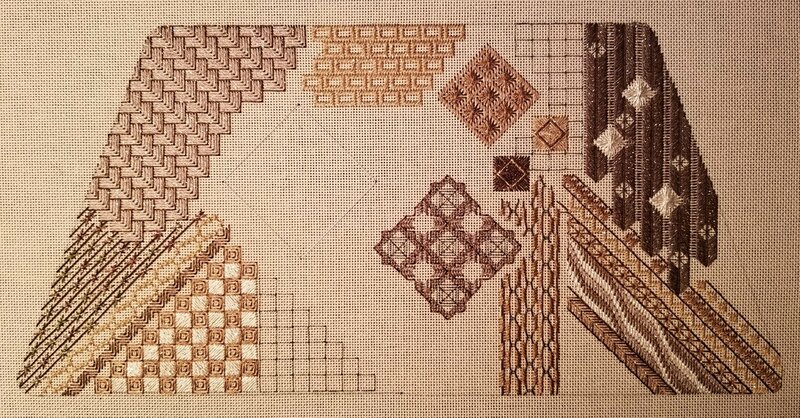 And, I finished the honey bronze diagonal wavy Smyrna pattern. I’ll add beads in the open spaces later. Making great progress on my Bronze Purse by Toni Gerdes. Areas 1-15 are done except for attaching any beads and the medallion. It’s such a pretty design. 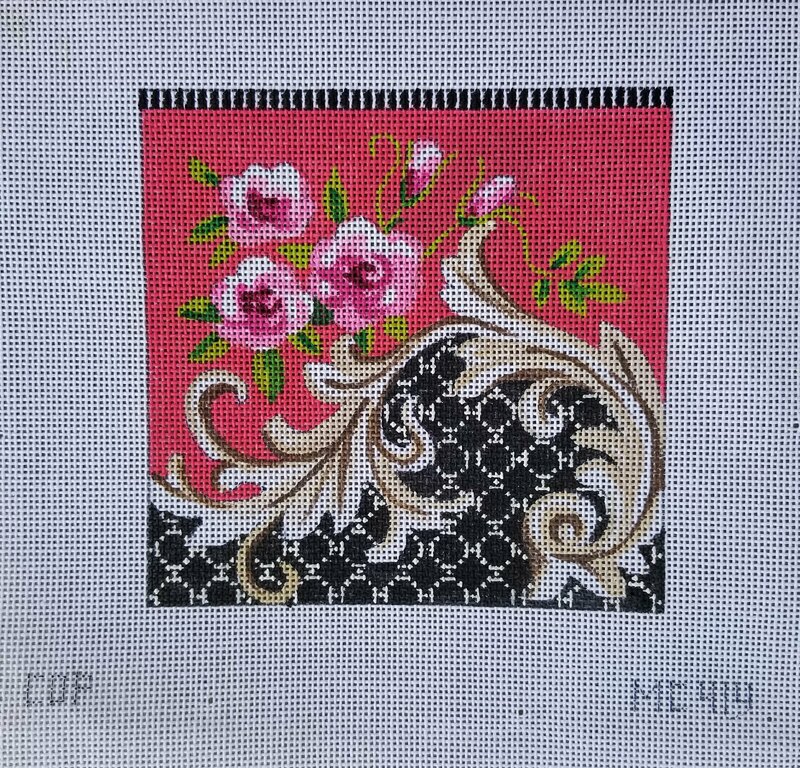 While there is a stitch guide, some decisions are left to me. And, more decisions were required because I counted wrong early on with the waffles. I was worried about the Congress Cloth being unforgiving and by that I mean showing enlarged holes if I had moved them. So, I stayed with what happened. I am so glad that I was able to join the 7th Blue Bonnet Stitching Retreat at Horseshoe Bay Resort in Texas this year. It was a beautiful resort. They have a pool, parrots, Zen garden, and 18 holes of natural grass putting greens (that we played as a miniature golf course twice). Good close games with Bill. I met some wonderful ladies from Houston, friends of Linda’s from past retreats. Linda was a great table companion – good thing – we both took the same classes. The 2 classes with Toni Gerdes were fantastic! The written and verbal instructions were clear, we worked on a line-drawn canvases, and they were well-paced classes. I’ll have no trouble finishing these at home – it’s only tough to decide which one to do first! This is my progress after 2 days of each class.